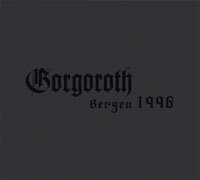 Recorded live in Bergen, Norway May 23rd 1996, this classic recording was originally released as a 7" EP entitled "The Last Tormentor" and was limited to 666 copies. This EP is now a long sold out and sought after cult item, and now, thanks to a collaboration between Regain Records and Forces of Satan Records, it is finally available again in an exclusive digipack MCD format! This recording is a piece of black metal history and is a must-have for fans of black metal in general, and fans of Gorgoroth in particular!